So I am always amazed by the speed at which some crops can grow and change. Last week it was all we could do to get all the tomatoes picked and this week a precipitous drop off (partly due to some varieties completely dying due to the wilt). Two weeks ago the winter squash looked vibrant, today the butternuts are beginning to die back and we will have to begin harvest of them in the next few days (I know “winter” squash in July but that is the reality in a non-New England climate). 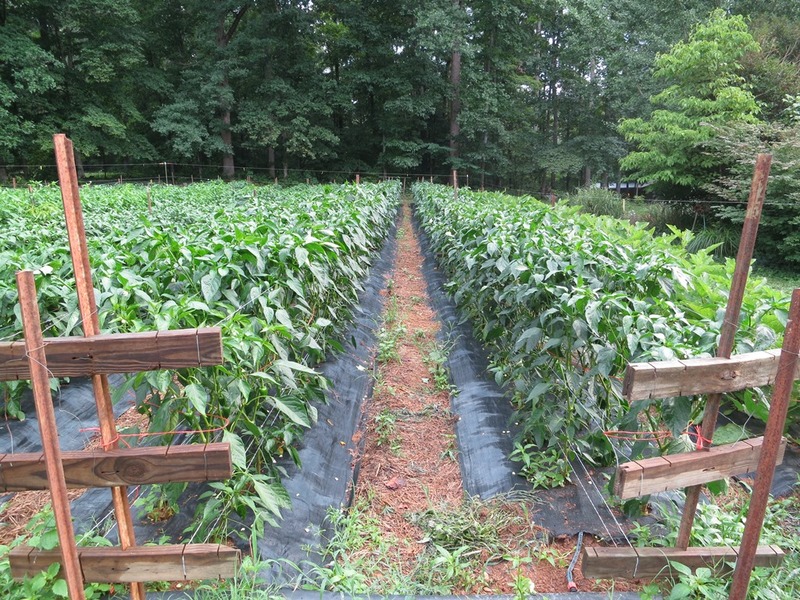 Yesterday we were doing a bit of trellising in the peppers to make sure they were ready for any crazy weather that might come in with the cool front and they look really fabulous and then I looked that the newsletter picture from just five weeks ago when they were barely a foot tall and now they are big bushy rows with some four feet tall! Not too many peppers to pick yet but most of the varieties have a lot of fruit set which should come in just in time for pepper roasting to begin in late August. We had some new farmers out yesterday and as we walked around the farm we talked about how our brains always seem to be working on the next season. We hardly have a chance to savor the crops we are harvesting at the time because we are beginning to focus on getting the next ones in the ground or keeping them happy until they start producing, like planting leeks and Brussels sprouts this week for fall or another layer of pepper trellis. While we eat tomatoes every day right now, mentally we are already moving on but wait I haven’t even made fresh salsa yet! That’s OK because just now I finally have all the ingredients as the first serrano peppers and a new planting of cilantro is ready to go with the red onions and select tomatoes, maybe we are not done with tomato season yet. Those are five foot tall posts holding the Poblanos up. A marked drop in tomato volume this week. In reds there are still a lot of Big Beefs and some sweeter Ultrasweets. Also a good amount of Cherokee Purples. We have much smaller supply in yellows Orange Blossoms and Kellogg’s Breakfast and in Striped Germans and Green Cherokees. Cherries galore with the best tasting Sungolds at market, yellow and pink mixed, Black Cherries and a great mix of yellow, red and green Blush types, very sweet. Small amounts of Romas and Italian Oxheart sauce types. No lettuce this week, but back next week. Sweet Red Onions. Basil along with Chives. Plenty of Cucumbers. A few more Shishito peppers along with Padrons, Jalapenos and Serranos. Celosia is back! Crazy felt like heads. Still great Lisianthus, long lasting mostly in purple this week. Lots of fabulous fragrant Oriental lilies. Great Sunflowers. Zinnias should be back. Of course beautiful Bouquets.